What’s been going on? Don’t think there’s any let up here! We’ve had the World Hello Day this morning, had the Speed Awareness Day yesterday, and we haven’t even started talking about the festivities yet! So we’ll start with the World Hello Day coffee morning today, and the mayor, who joined us to say hello. 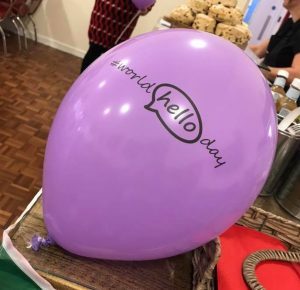 The day starts life as an awareness day for peace and positivity through saying hello, talking to more people and helping to prevent social isolation. And actually, the fun that can be had through talking to more new people is immense. Our coffee morning was just that, having people come along to have a chat with new people over a good cuppa and cake, (topics today included Sunday roasts with lashings of gravy, and dogs). Sounds like we’re going back to basics here, but it’s incredibly effective, finding some common ground can work wonders for self-esteem and confidence, as well as seeing through any differences people have. In all a really good coffee morning! Shall we talk about the Speed Awareness Day next? Held at Lincoln College, which I’ve never been to before, we were stationed in the Knights Building. It’s the former Tradex superstore, which I hadn’t remembered, that they’ve turned into a good sized open space, mainly used for events and exams. Seeing some familiar faces, we were able to network alongside marketing our projects and courses, and discuss the festive period going into 2019 (!!!). Spoiler alert, we saw Dial a Ride and confirmed their stall at our Christmas Fair on the 7th! 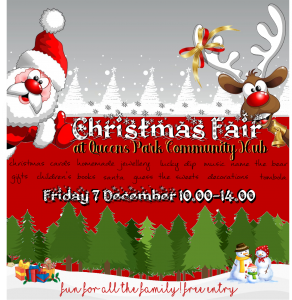 We’ve got the Christmas Fair on the 7th at Queens Park Community Hub. That’s running from 10.00 till 14.00 and we’ve got people from the Hub to join in the festivities, plus some external stall holders joining us which I’m really excited about – lots of variety to be had this year! 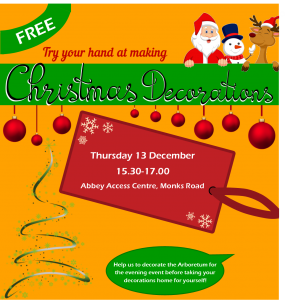 Then we have the Christmas Decorations workshop, which is being run by Lincoln’s very own Art Ninja. The aim of the game is, using a collection of different materials (some you wouldn’t expect!) and techniques, to have the bandstand decorated for the Carols in the Arboretum event, so you’ll get chance to help decorating that before taking them home for yourself. 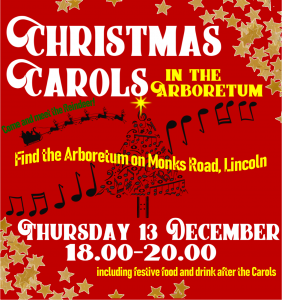 And we also have the big Carols in the Arboretum event, again on the 13th December, from 18.00 till 20.00, and there’s Reindeer!! We’re all very excited for not just them, but also the Santa Sleigh for photos, and the owl. So you need to get your best singing voices ready! Or shall we leave that to the choirs and groups joining us?! Either way, it’ll be a fun night for all the family to come together for some festive cheer. 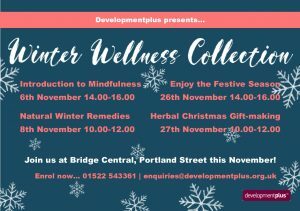 And finally, we have our last 2 Winter Wellness sessions, one in Mindfulness (Enjoy the Festive Season) and one Herbal (Herbal Christmas Gift-making). They’ve turned out great so far, so lets keep that on track for the last 2! We’ve still got a limited number of spaces available if anyone’s interested, so contact us via social media, phone or email to find out more – but be quick to secure your place!